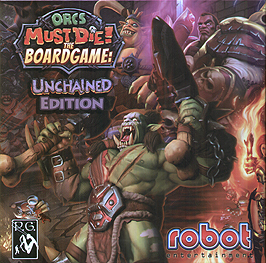 THE AWARD WINNING GAME ORCS MUST DIE! HAS AT LAST MADE ITS WAY TO THE TABLETOP! THEN WATCH SWARMS OF BADDIES PLUNGE THROUGH YOUR DEFENCES. Each individual game supports 1-4 PLAYERS who must cooperate to survive the enemy onslaught. You and your friends each choose a hero as your game avatar. Each hero has an individual card, with his characteristics, SPECIAL ABILITY, and SUPERPOWER that you need to save for the right moment. Each hero also comes with an heroic-sized figure and special weapon upgrades. Look for our companion game, ORCS MUST DIE! THE BOARDGAME: ORDER EDITION. You can combine the two games to go head-to-head with rival fortresses, with UP TO 8 TOTAL PLAYERS!